Inflammation of one or more bursae of synovial fluid in the body. Bursae (one is a bursa) are fluid-filled sacs that cushion areas of friction between tendon and bone or skin. Persons most commonly affected: Though the majority of people affected are elderly, it can affect any person irrespective of their age groups. Symptoms and indications: Bursitis symptoms vary from local joint pain and stiffness, to burning pain that surrounds the joint around the inflamed bursa. In this condition, the pain usually is worse during and after activity, and then the bursa and the surrounding joint become stiff the next day. Causes and risk factors: The most common causes of bursitis are trauma, infection, and crystal deposits. 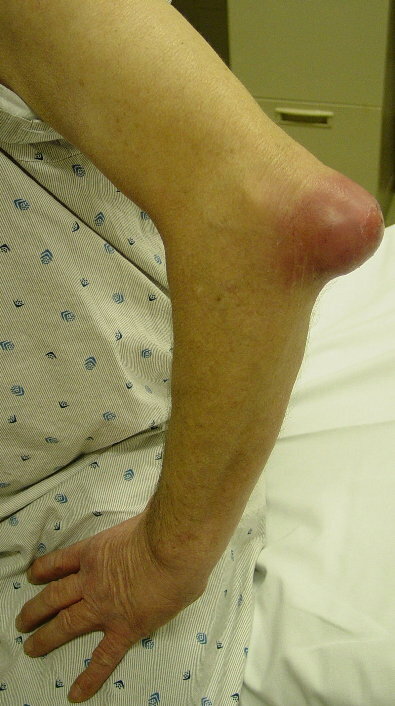 Bursae close to the surface of the skin are the most likely to get infected with common organisms; this is called septic bursitis. These bursitis-causing bacteria are normally found on the skin: Staphylococcus aureus or Staphylococcus epidermis. People with diabetes or alcoholism and those undergoing steroid treatments or with certain kidney conditions, or who may have experienced trauma may be higher risks for this type of bursitis. About 85% of septic bursitis occurs in men. People with certain diseases such as gout, rheumatoid arthritis, or scleroderma, for example, may develop bursitis from crystal deposits. Little is known about how this process happens. Uric acid is a normal byproduct of daily metabolism. People who have gout are unable to properly break down the uric acid, which crystalizes and deposits in joints. Prevention: If a certain activity causes you to develop bursitis, then limit that activity or use protective measures. Use kneepads or cushioning for gardening and scrubbing floors. Workers such as plumbers, roofers, and carpet layers should wear knee protection. Choose more appropriate shoes or cushion the ankles with pads.